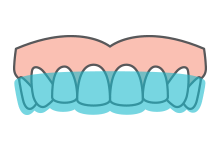 Standard dentures are made for people who are already missing all their teeth. At the Denture Care Clinic, we provide custom made Mouthguards. Your initial visit to the Neutral Bay Denture Care Clinic will involve a few special steps so that we can get to know you. To understand what to expect, please read through this page and the Contact Us page. You’ll find all the practical information you need, such as a map and directions to our office, practice hours and more. Your expectations during your first appointment should not be stressful. Our compassionate and caring Team will do everything possible to ensure your visit is a pleasant and relaxing experience. Sam’s knowledge of Implant Retained Dentures and the implementation of the Valplast Partial Denture System (without wires) makes him one of the most qualified, proficient and experienced Dental Prosthetists in Sydney. Should you require further intervention, we can refer you to your dentist or doctor as appropriate. The Team at the Neutral Bay Denture Care Clinic look forward to meeting you!